Waardenburg Syndrome is a rare disorder of neural crest cell development. It is genetically inherited. Varying in prevalence from 1:42000 to 1:50,000, it compromises approximately 2-5% of congenital deaf children. The syndrome is not expressed in its complete form, in about 20% cases, which adds for its heterogenisity . Even among people affected in the same family,the features do vary. Unilateral heterochromia that manifests as lighter pigmentation of one iris is associated with Waardenburg syndrome and Parry-Romberg syndrome and less commonly with Hirschsprung disease. A case of ten yrs. old boy with a typical facial profile and hearing loss is reported. Waardenburg syndrome (WS) is a rare inherited disorder of neural crest cell development. It usually shows an autosomal dominant mode of inheritance, but autosomal recessive inheritance patterns are observed in some subtypes. The highest reported incidence of WS is among Kenyan Africans. The prevalence varies from 1:20000 to 1:40000. WS accounts for between 2% and 5% of cases of congenital deafness. WS syndrome is characterized by physical absence of melanocytes affecting skin, hair, eyes, or stria vascularis of cochlea. 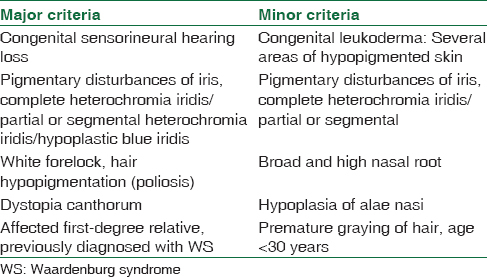 Either 2 major or 1 major and 2 minor criteria should be present for a diagnosis of WS [Table 1]. We report a 10-year-old boy with typical facial features of WS and hearing loss. A 10-year-old boy was referred to ophthalmic outpatient department for examination; it was observed that both irides of patients are abnormally brilliant blue in color. The patient also gave a history of hearing impairment in his right ear. Ophthalmological examination revealed hypoplastic blue iris in his left eye and sectoral heterochromia with hypoplastic blue iris in his right eye [Figure 1]. The pupils were briskly reacting. Dilated fundi showed pigment mottling, a cup: disc ratio of 0.3:1, and normal-appearing macula. He had a wide intercanthal distance. The inner and outer canthal distances were measured with a hard ruler and were found to be 40 and 100 mm, respectively. His eyebrows were normal in appearance, with no midline touch (synophris). He had a broad nasal root and his alae nasi were hypoplastic. 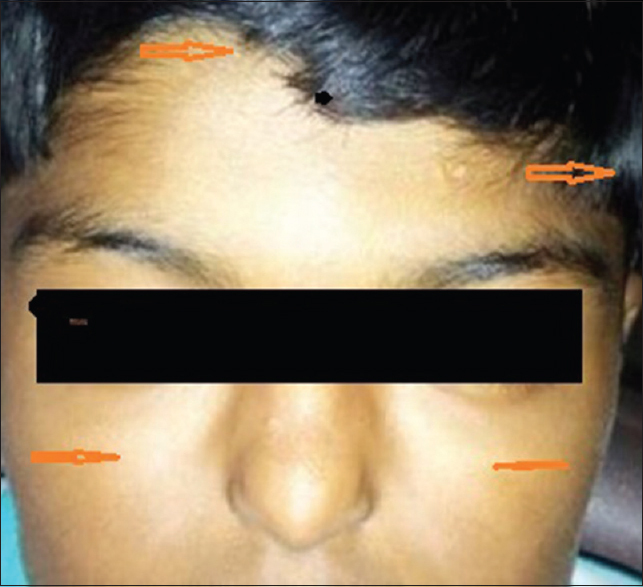 The child had two white streaks of hair in the midline area corresponding to frontal area and occipital area. Examination of scalp did not show any patch of depigmentation. A hypopigmented patch was seen on his left cheek [Figure 2]. 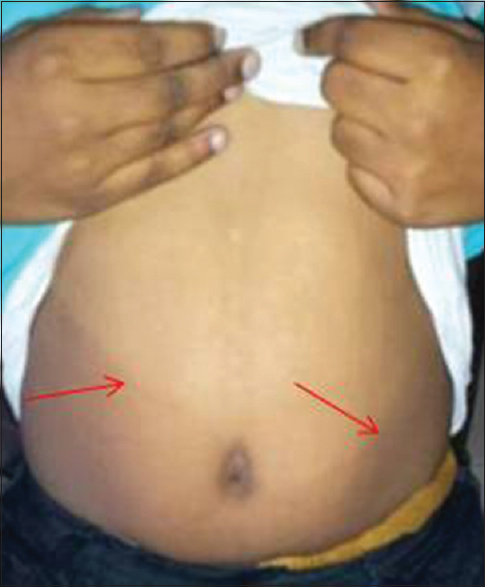 A large hypopigmented patch with clear outlines of normal pigmentation was seen on his upper abdomen [Figure 3]. Ear, nose, and throat consultation was sought and revealed bilateral hearing impairment with 83.3 dB loss in the right ear and 28.3 dB loss in the left ear. As per the WHO classification of hearing loss, the patient was classified to have severe (71–91 dB) and mild (26–48 dB) hearing loss in his right and left ears, respectively. The Waardenburg index was calculated, which was 2.343 (>1.95). On this basis, a diagnosis of WS subtype I was made. The patient was given an amplification device (a behind the ear hearing aid) for his right ear and was planned for a cochlear implant. He was advised lip reading and was cautioned for the use of ototoxic drugs. WS syndrome is characterized by physical absence of melanocytes affecting skin, hair, eyes, or stria vascularis of cochlea., When present, melanoblasts may fail to reach their respective locations or may not attain their final differentiation. As limb muscles and intestinal ganglia are also derived from neural crest cells, involvement of limb muscles in Type III and that of intestinal ganglia in Type IV is attributed to a developmental anomaly of neural crest cells. A possibly increased risk of neural tube defects is also reported with WS I subtype. Heterochromia iridis (one iris with a different color than the other) result from differences in distribution and concentration of melanin in the iris. In case of heterochromia iridum, some part of the same eye is affected while the remaining part appears normal. In the present case, bilateral iris hypochromia was present showing typically blue iris. These types of findings are mainly reported with WS Type I. Genetic and molecular studies for the early detection and multidisciplinary approach toward management are required. Pingault V, Ente D, Dastot-Le Moal F, Goossens M, Marlin S, Bondurand N, et al. Review and update of mutations causing Waardenburg syndrome. Hum Mutat 2010;31:391-406. Nayak CS, Isaacson G. Worldwide distribution of Waardenburg syndrome. Ann Otol Rhinol Laryngol 2003;112:817-20. Dourmishev AL, Dourmishev LA, Schwartz RA, Janniger CK. Waardenburg syndrome. Int J Dermatol 1999;38:656-63. World Health Organization: Prevention of Blindness and Deafness; Grades of Hearing Impairment; 1980. Available from: http//www.who.org.hearingimpairment. [Last accessed on 2014 Mar 24]. Faivre L, Vekemans M. Waardenburg Syndrome Type I, Orphanet Encyclopedia; April, 2005. Available from: http://www.orpha.net/data/patho/GB/uk-WSI(05).pdf. [Last accessed on 2014 Mar 24].